Housed in part of the quattrocento Palazzo Fava-Ghisliardi, the Museo Civico Medioevale is one of the unmissable sights of the city. Before you get to the good stuff, however, you’ll have to wade through the delightfully screwy private collections accumulated by 18th-century museums, which are preserved here for no apparent reason beyond our entertainment (also, as you may have noticed by now, Bologna is a city that never throws anything away). There’s a mummified baby something, carved ostrich eggs and coconut shells from exotic climes, a smattering of pre-Columbian art, a carved narwhal tusk, and courtesans’ slippers from Venice with 18-inch heels (a fashion inspired by the harem of the Ottoman sultans). Once through that, you’ll see something that really brings old Bologna back to life – a collection of the tombs of the great doctors of the University. By convention, these would be carved with images of the professors in relief, expounding to a crowd of attentive students. Part of the convention was to make these scenes as lifelike as possible – so many students, with so many faces from over the centuries, earnest, daydreaming or perplexed. Some of the best, from the beginnings of the Renaissance, are by Paolo di Bonaiuto (the Sepolcro di Lorenzo Pini), the Tuscan Andrea da Fiesole, and the Dalle Masegne brothers (notably the Arca di Carlo Roberto e Ricardo da Saliceti of 1403). The delle Masegne touch is also shown in the statues of Justice and four patron saints of Bologna, which originally decorated the Loggia della Mercanzia (1391). Like any good medieval museum, this one has no end of surprising pretty things (many donated by the city's 19th-century great benefactor, Pelagio Palagi, such as the mosaic Byzantine Madonna from c.1100 made from the tiniest of tesserae). 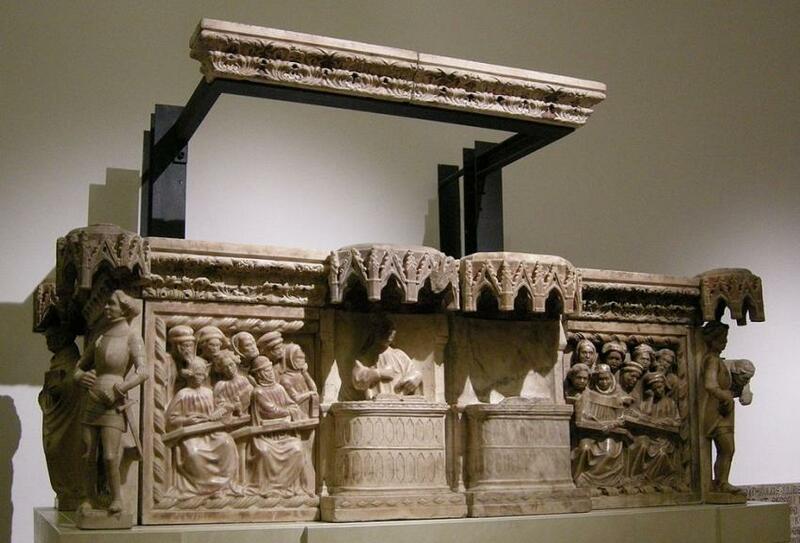 There is an exceptional collection of ivories, a field where medieval sculptors could display their skill in miniature. The best were made in Venice and France; here the Venetians of schools like the 14th–15th-century Bottega degli Embriachi, with their trademark spiky foliage borders, compete with French artists who created little coffers for jewellery, and little portable altarpieces for personal devotion, carved with intricate scenes that capture medieval civilization in full flower. Along with the exquisite, there’s always a touch of the bizarre, such as the colossal statue of Pope Boniface VIII, in gilded copper plate, made by Manno Bandini da Siena (1301). This most grasping and arrogant of all popes, whose impostures wrecked the powerful medieval papacy, commissioned this statue and many like it across Italy, an early sort of political propaganda; Boniface also invented the beehive triple tiara popes used to wear, to show that they were three times mightier than mere kings and emperors. The massive cope near the statue is a fine example of 13th-century English needlework, embroidered with the Life of Christ. The collection of sculpture goes on to Jacopo della Quercia’s group of the Madonna and saints, with flowing draperies that proclaim the Renaissance has arrived (1410). Among the later works are a bronze bust of the Bolognese Pope Gregory XV by Bernini, and Giambologna’s Mercury (a virtuoso work, showing the messenger of the gods poised on one foot, one of the four he sculpted) and a St Michael the Archangel by Bernini's great rival in Rome, Bologna native Alessandro Algardi). Bologna had a fine school of miniaturists, and their work is displayed in music books and in the 1361 Statutes of the Arte dei Merciai (merchants’ guild). There are also collections of armour, ceramics, majolica plates, glass (including spectacular works from Murano). In the courtyard of the museum is a building that you might consider an additional exhibit: the 13th-century Torre dei Conoscenti, a typical example (and rare survivor) of the house-and-tower complexes of the Middle Ages. Near it you can see the only surviving bit of Bologna’s original Roman–Dark Age city wall.